I think this qualifies as a toy. You have through 12/6 to enter. US only. What do you think? Good luck. Lip gloss is always a big hit with girls. Combine that with a toy that kids love, and you get a toy that’s on Walmart “Top 25”, and Toys R Us “Fabulous 15” lists. 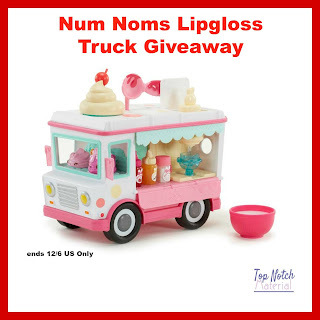 This is the Num Nom Lipgloss Truck! 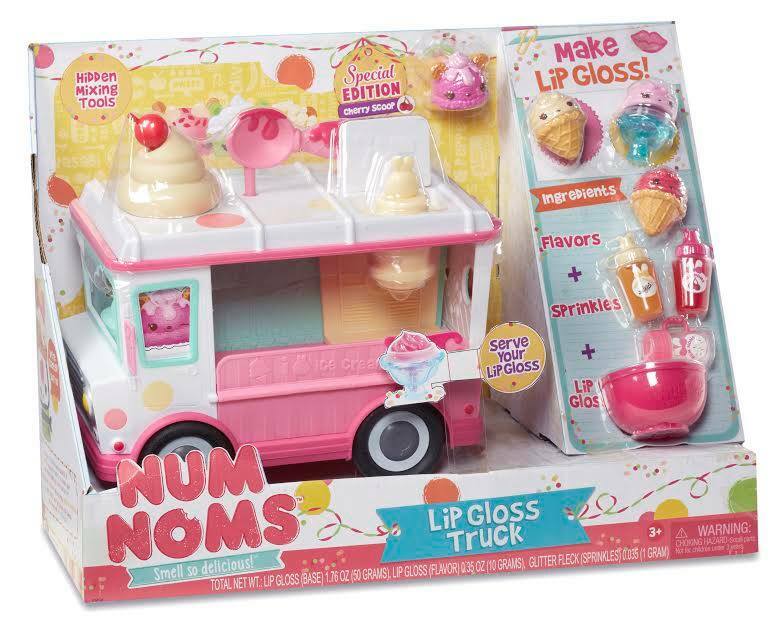 This is a truck that your little one can make their own flavor of lip gloss and serve it up like an ice cream cone! How fun is that? Check out Katrina at Top Notch Material and what she thought of the toy! Ok now for the really fun part! 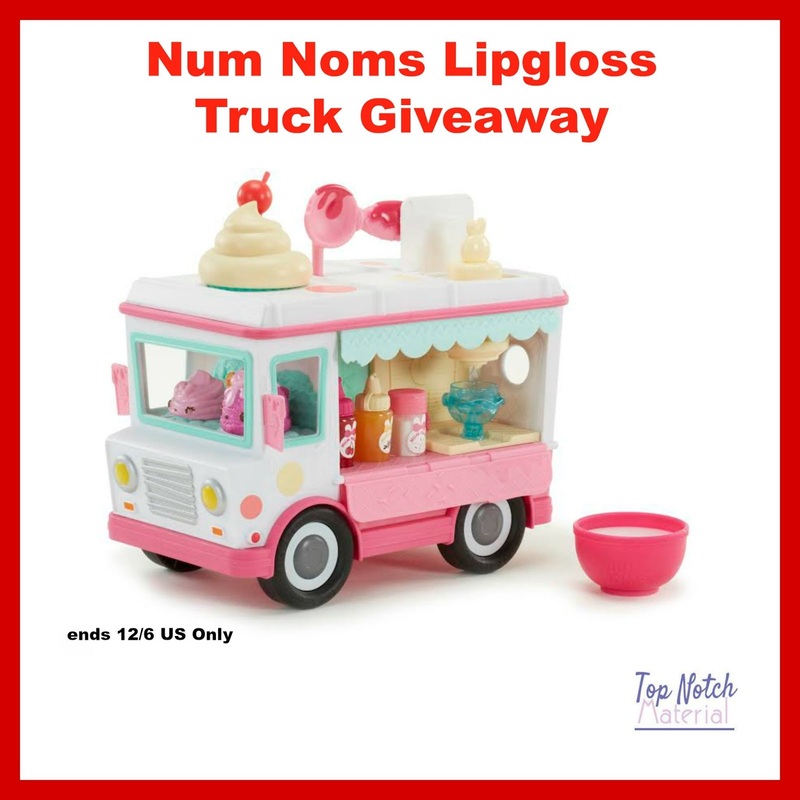 One lucky winner will win their own Num Nom Lipgloss Truck. Follow the Giveaway Tools below for your chance to win! I would give this my daughter and she loves coconut. I would give this to my niece for Christmas and her favorite Lip gloss flavor is Bubble Gum. I would give this to my daughter. Her favorite flavor of lip gloss is cherry. I would give this to my tween daughter, she loves sweet yummy smelling flavors! I would give this to my 11 year old niece! She would love this and she loves fruit flavored lip glosses. Thank you for the chance to win! My niece. She's crazy about raspberry, banana and strawberry right now. So any of those flavors will have her thrilled!! I would give this to my sweet niece. She would love the strawberry. I would give this to my granddaughter,and her fav.flavor is strawberry. I would give this to my granddaughter. She likes cherry lip gloss. I'd give this to my sister. She likes minty and fruity lip gloss! my niece Meredith. I think she'd like fruit or chocolate flavors. 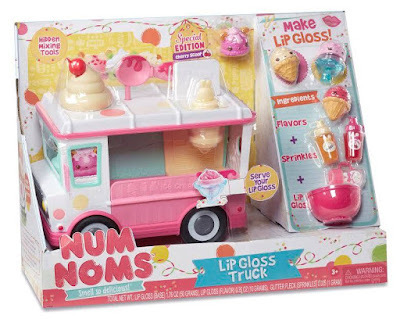 My daughter likes mint lip balms, but she says she is "too ol for toys" so I would probably give it to my niece. I would give this to my daughter and her favorite lip gloss flavor is cherry. I would give this to my niece.her favorite lip gloss flavor is bubble gum. Cherry flavor lip gloss is my favorite! I'd give this to my niece.. I think she'd love it! I would give this to my daughter! She loves bubble gum flavored lip gloss!